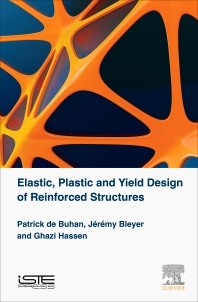 Elastic, Plastic and Yield Design of Reinforced Structures presents a whole set of new results which have been published by the authors over the last 30 years in the field of continuum solid mechanics applied to the analysis and design of reinforced civil engineering structures. The focus is on the development and application of up-scaling/homogenization methods in the design of such composite structures, with a special emphasis on the plastic behavior and ultimate strength of materials. The specificity of the book is highlighted by at least two completely innovative concepts which lie at the very heart of the book’s originality: the elaboration of a fully comprehensive homogenization-based method for the design of reinforced structures (and not only materials), through the study of macroscopic behavior, and the development of a multiphase model for materials reinforced by linear inclusions, which considerably extends the range of applicability of the classical homogenization procedure. Features development of a multiphase model for materials reinforced by linear inclusions, which considerably extends the range of applicability of the classical homogenization procedure. Patrick de Buhan is Professor in Structural Mechanics (plasticity and yield design) at Ecole des Ponts ParisTech in France. Jérémy Bleyer is a lecturer and researcher in Structural Mechanics at Ecole des Ponts ParisTech in France. Ghazi Hassen is a lecturer and researcher in Solid and Structural Mechanics at Ecole des Ponts ParisTech in France.